At the end of the 2012 season, Ace Sanders broke the hearts of Gamecock Nation by forgoing his Senior season to enter the 2013 NFL Draft. Now, Gamecock fans everywhere have been wondering, “Who will replace Ace?” It’s a very logical question, but not entirely for his receiving yards. On the season, he had 45 catches for 531 yards. However, he led the team in receiving touchdowns (9). Even with that, you can think, “Okay, that’s manageable.” Then you look at his work as a Punt Returner. That’s when you say, “Oh $%!t…” Ace brought life to the punt returns that had been absent for almost ten years (2003 vs. Florida was the last punt return touchdown prior to the 2011 season). Last season, he lit up the field on punts, amassing a team record 429 yards on 28 returns with two touchdowns. Now the question is on everyone’s mind. Who will take his place? The answer is not simple. One person will not replace Ace Sanders. Even if you try Bruce Ellington at punt returner, you still need someone to take his place in the offense. Let’s start at the receiver position. I predict Busta Anderson to fill in. (Dude’s Note: McEachern High School whassaaaaaaaaaaap?) I know, I know. He’s a tight end, but as Andrew and I discussed briefly on the DudeYouPodcast a few weeks ago, he is a great receiving tight end. He will assert himself as one of the best tight ends in the nation and look to the Patriots to draft him to replace Aaron Hernandez in the 2014 or 2015 draft. Now, to fill in as a punt returner. This is much more difficult given our lackluster special teams play since the Holtz Era. So, instead, I am going to give a short list of possible replacements that could at least manage the returns. I don’t expect anyone to build the statistics that Ace did. Nick Jones would be my first choice. He has similar size and speed to Ace (Ace: 5’8″ 175 pounds; Nick: 5’7″ 174 pounds … These are their height/weight according to the South Carolina Athletics Site) and he has good moves to avoid the tackles. Do I think he’ll bulldoze through Mizzou like Ace did? Probably not, but I do think he would be a good returner. Incoming freshman, Pharoh Cooper, is expected to get a look this fall. His senior season in high school was electric. He dominated as a returner. He has elite quickness and moves. My only concern is translating the high school skill into SEC skill. Not many athletes can translate immediately to the SEC as a freshman with only fall camp under their belt. Lastly, another incoming freshman I am extremely high on, Jamari Smith. I have a feeling if he gets a shot, he’ll prosper. He ran away from defenses for 2800 yards in Florida 8A Ball. Altogether, I think the Gamecocks will be okay if, and only if, someone steps up as a punt returner. I hope they don’t make Ellington the punt returner for the sole reason he already returns kickoffs and is a huge part of the offense. I’m eager to see who fields the punts this year, August 29th is closing in Gamecocks! It’s great to be a Gamecock! 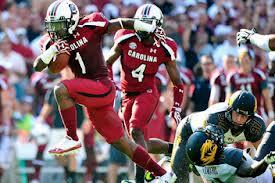 Posted on July 18, 2013, in Blog, SEC, South Carolina Gamecocks and tagged SEC, South Carolina. Bookmark the permalink. Leave a comment.